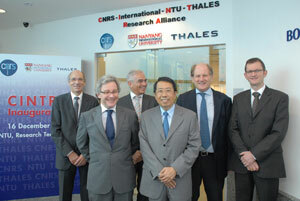 (Nanowerk News) In October 2009, Nanyang Technical University (NTU), the National Centre of Scientific Research (Centre National de la Recherche Scientifique or CNRS) and the Thales Group of Companies inked a Memorandum of Understanding (MOU) to establish the CNRS International-NTU-Thales Research Alliance (CINTRA) Laboratory – a state-of-the-art research facility focused on developing nanotechnologies for defence and commercial applications. The high-tech laboratory formally opened its doors on 16 December 2009, in a ceremony presided by His Excellency Mr Olivier Caron, the Ambassador of France to Singapore. Located at the Research TechnoPlaza, the CINTRA Laboratory will harness the latest in science and technology to develop innovations for computing, sensing and communications applications. NTU and its French partners unveil a joint research laboratory that seeks to overcome challenges in microelectronics and photonics research. Over the next two years, a team of about 50 Singapore and French researchers will work together to develop novel nanocomponents and circuit architectures, to meet future commercial as well as defence and security needs. This includes coming up with solutions to critical issues and challenges faced by existing technologies in the microelectronic and photonic industries. An example of application-driven challenges that the Singapore-French team of scientists will be tackling is the development of enabling technologies such as an imaging chip that processes and displays real-time multi-dimensional information, and a superfast, energy-efficient signal processing chip that can handle a trillion bits (terabit) per second or more. In his welcome address at the inauguration of the CINTRA Laboratory, NTU President Dr Su Guaning said that the signing of the tripartite MOU and the inauguration were a strong testament of how far NTU had come in its endeavour to become a great global university. He attributed the university’s achievements to its large pool of highly energetic and talented faculty, and how NTU had always sought to be relevant to the needs of industry, innovating and pioneering applications while building on the core competencies of its faculty and researchers. “Together with CNRS’ strength in research and Thales’ experience in the global market, we shall make the CINTRA Laboratory an example of how upstream research can turn into successful commercial products and applications in a most unexpected way,” said Dr Su.